I am deeply disappointed to hear that AERBVI is attempting to revive NAC, a name synonymous with the most regressive tendencies in work with the blind. There is little point in detailing why I find this decision so repugnant. If you have not read the history, please do so. The field of work with the blind seems to have moved toward a respectful incorporation of customer-centered thinking in policy and program development over the past few decades. Revival of NAC is the clearest way imaginable to reject blind customers, both individually and collectively. If you believe a blindness-specific accreditation process has merit, I recommend that you begin at the beginning and work with the National Federation of the Blind to create a mutually respectful dialogue on best practices. 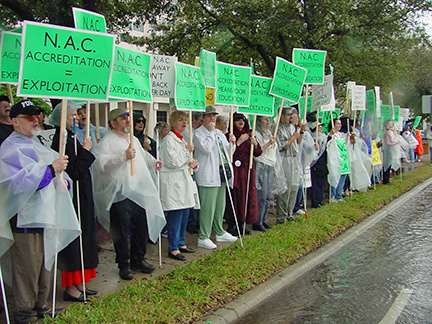 I would rather not stand in the sun and the rain demonstrating against NAC-accredited agencies, but I will not allow a desire for the appearance of peace and harmony to permit the clock to be turned back. Our signs in the last round said, “No Accreditation without Representation.” This time they may read “Nothing About Us Without Us.” It’s the same message. How unfortunate that AERBVI never read the memo. Some organizations are associated with honor, credibility, and trust. Others are not. Sometimes an organization’s reputation is so tarnished that it is better to let it pass into history and start afresh. Does the need still exist or is it being filled by other organizations? When I think of NAC, I think of a history that will be difficult or impossible to live down. But with NAC it is more than just a failed organization that played fast and loose with the concept of accreditation. It is an orientation, a view of the place blind people occupy in society, and in particular our place in work with the blind. NAC was a part of the professional establishment that told us that being blind had little or nothing to do with understanding the services blind people needed or how they should be delivered. Rather than seeing us as the most reliable barometer of an agency’s services, its integrity, its willingness to innovate, and its dedication to work with the blind, NAC has too often turned a blind eye to abuse in schools it has accredited. Likewise NAC has turned a deaf ear to meaningful input from blind people who have a significant interest in schools and agencies where we get service. AER has had its own conflicts with blind people, but bettering the relationship between it and the organized blind of America has been decades in the making. AER’s association with NAC is a step in the wrong direction, harkening back to the days when blind people were to be seen but not heard, placed on lists as clients but excluded from critical influence. I would rather talk than walk, but when talk is not enough and protest is my only choice, there are things I believe worthy of my public demonstration alongside my friends and colleagues in the National Federation of the Blind. Of course we have an alternative. Identify what needs standards that should be addressed by accreditation, use the systems already doing accreditation, and if there is still a need, build a system from the ground up that includes blind people. Let a core value of that system be that there will be nothing about us without us, and do all of this in a way that is so fair and transparent that no reasonable person will question what is being built. Let there be no tokenism when it comes to representation, no votes in which a decision is decided twenty-seven to one, and the one dissenting vote came from a representative of the largest organization of the blind in the world. It is often observed that we should not reinvent the wheel. The clear meaning is that we should keep the good and go forward. The corollary is that we quit using those things which do not work. Einstein is sometimes quoted as saying that insanity is doing the same thing over and over again and hoping for different results. Whether the quotation comes from Einstein, Twain, or some other author, it doesn’t take the brains of Einstein to know that the blind deserve better. Those committed to working with the blind deserve better. Those who are paid through charitable or governmental funds to work with the blind deserve better. Let NAC go its way, and if there is a demonstrated need for accreditation that is not already met, build it with the blind. Let us build for the future and not try to escape from or explain away the past. Real lives demand real solutions, and NAC is not a part of any solution.